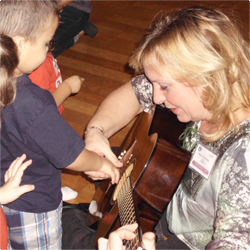 Ms. Marla creates a fun, informal, social setting that spurs engagement and supports each child's musical development. After watching her daughters, Sarah and Rebekah, thrive in the Music Together® program, Marla enthusiastically enrolled in a training course to become a director, giving Sarah and Rebekah the opportunity to grow up with Music Together. 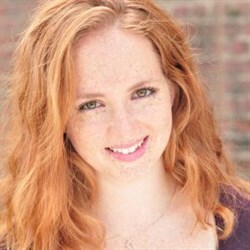 Marla began teaching Music Together® classes in 2001, in the state of Maryland. After establishing her business in seven Maryland locations, Marla continued participating in Music Together training workshops and assisting in other centers. She has enjoyed teaching preschool music in both public and private school systems and has been active in her church music programs, where she has served as the Children's Praise and Worship Leader, the Cherub Choir Director for 3 to 5 year olds, and Assistant Director of the Children's Choir for grades one through six. She has also served as Music Director for Pee Wee Pirates, ages 3 through 5, and worked with children as lead daycare provider. Since relocating to Florida in 2009, Marla is delighted to share her passion for musical training and fun with parents and children in the Orlando area. Come and meet Marla and experience the joy of her classes with your family. Miss Marla also presents, The Birthday Beat, memorable musical birthday parties for children one to five years old. Marla Stevenson is the President of Drums in Recovery, Inc., a nonprofit organization, founded in 2015. She facilitates the evidence-based program, DRUMBEAT, which explores connections between making music together as a group and the development of healthy relationships. Please visit www.DrumsInRecovery.ORG. Jillian Marini has always had a passion for music, teaching, and the arts. A Florida district winner of the prestigious Metropolitan Opera National Council Audition in 2017, Jillian has the talent, experience, and expertise to make her teaching incredible. She holds a Bachelor of Music degree in Voice and Opera Performance from Northwestern University and has performed all across the United States. In addition to her Bachelor of Music degree, she also holds a certificate from the Middlebury Language School for German Language and German Music Performance, and an Animation and Visual Effects certificate from The Digital Animation and Visual Effects School. Jillian created Songbirds Music, Art, and Dance Center to create a safe and positive environment where students, professional artists, and artists of every level in between are able to grow, experiment, and collaborate to bring life to their art and passion. Before opening Songbirds, Jillian maintained a full voice and piano studio. She has over eight years of teaching experience and loves to see her students grow and bring their musical talents to fruition. When not at Songbirds Music, Art, and Dance Center, Jillian enjoys singing at both local churches and synagogues as well as spending time with her feisty dog. Christina Campbell is a 2006 Bachelor of Music graduate from the University of Arkansas. She taught K-6 music in southwest Missouri for 8 years. She has completed level one training of the American Orff-Schulwerk Association Teacher Education Curriculum. She left public school teaching to pursue an equivalency certificate in Music Therapy from Saint Mary-of-the-Woods College. She learned about Music Together from one of her Music Therapy supervisors who used the curriculum in her practice. In 2016, she became a Music Together teacher and led classes in northwest Arkansas. Her family relocated to central Florida about a year ago so that her husband could follow job opportunities with WDW. She also works for the Mouse and play in the Same Is Lame Jazz Ambassadors based out of Clermont. Her primary instrument is flute, but she is competent on many instruments: voice, recorders, guitar, piano, tenor sax, and percussion. Christina is very excited to continue sharing Music Together in the central Florida area.